TOKYO -- Indicted former Nissan boss Carlos Ghosn, speaking out in a video message, blasted the automaker's current management for driving business into reverse and then "selfishly" protecting their own jobs by instigating a "backstabbing" coup to remove him from office. Ghosn, who saved the Japanese automaker from near bankruptcy in 1999, said the current state of Nissan is "sickening" and said he was worried today's top brass lack vision. Without naming individuals, he said their own fear of losing control -- as Nissan marched toward a merger with French alliance partner Renault -- spurred them to hatch a plot against him. Ghosn painted his picture of a scheming executive suite in a seven-and-a-half-minute video message aired by his lawyers April 9 at the Foreign Correspondents' Club of Japan in Tokyo. The calm and collected Ghosn, wearing a dark jacket and white shirt, looked a little thinner in the face and sported graying hair. He spoke with his hands clasped on a desk before him. "This is not about greed. This is not about dictatorship. This is about a plot. This is about conspiracy. This is about backstabbing," Ghosn said. "There was first a fear that the next step of the alliance, in terms of convergence and in terms of moving toward a merger, would, in a certain way, threaten some people or eventually threaten the autonomy of Nissan." Ghosn lawyer Junichiro Hironaka said the video was filmed April 3, the day before the former chairman of Renault, Nissan and Mitsubishi Motors was arrested for a fourth time in Japan on suspicion of financial misconduct during his time at the helm of Nissan. 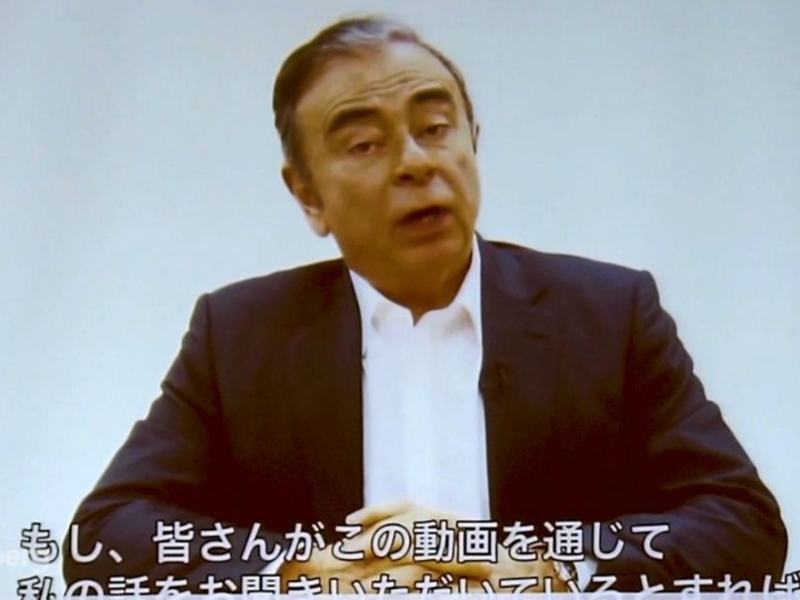 In his video, Ghosn depicted himself as a Nissan loyalist who loved the company and always acted in its best interests. He said the Nissan's independence was never once threatened in the past 19 years and called himself "the fiercest defender of the autonomy of Nissan." Ghosn also reiterated his innocence and expressed hope for a fair trial. But the fallen auto executive, who handed over operational control to CEO Hiroto Saikawa in 2017 when he stepped back as chairman, spent much of the video trying to tear down today's management, despite being completely severed from the company. On April 9, after Ghosn filmed his message, shareholders voted to boot him off the board, thereby cutting him loose for good. Still, Ghosn decried the current state of Nissan's business as "absolutely mediocre" and accused top management of railroading him in an attempt to deflect blame. He cited three profit warnings in recent years and "many scandals" without getting into specifics. "I'm talking here about the few executives who, obviously, for their own interest and for their own selfish fears are creating a lot of value destruction. Names? You know them," Ghosn said. "I'm talking about people who really played a very dirty game." Ghosn also cast doubt on the reboot of the alliance between Renault, Nissan and Mitsubishi following his removal as chairman at all three automakers. "I'm worried because obviously the performance of Nissan is declining," he said. "But also, I'm worried because I don't think there is any vision for the alliance being built." Ghosn's arrest cast a shadow over the future of the 20-year tie up, which Ghosn built into the world's largest auto group. Nissan and Renault eye each other with suspicion. But last month, the leaders of the companies tried to mend relations by forming a new consensus-based four-person board to run operations, in place of Ghosn's one-man rule. Ghosn took a dim view of that effort. "Frankly, sitting down there on the table, being consensual about decision, this is not a vision in an industry which is as competitive as the car industry," Ghosn said. "You need to make sure that from time to time, leadership is exercised. And leadership means we do what's good for the company, not what you are capable to agree on. This is not dictatorship. This is leadership." After the release of Ghosn's video, Nissan issued a statement saying the "sole cause of this chain of events" was Ghosn's alleged financial misconduct. "Aside from any criminal matters, Nissan's internal investigation has uncovered substantial evidence of blatantly unethical conduct," Nissan said. "Further discoveries related to Ghosn's misconduct continue to emerge. The company's focus remains on addressing weaknesses in governance that failed to prevent this misconduct." Prosecutors arrested Ghosn for a fourth time on April 4, on breach of trust suspicions for allegedly causing some $5 million in damages to Nissan from December 2015 through July 2018, while Ghosn was CEO and chairman of the Japanese automaker. The sweep landed Ghosn, 65, back in the Tokyo detention center where he spent 108 days following his initial arrest Nov. 19. Ghosn was released on a $9 billion bail on March 6 but was free for less than a month before being re-arrested on the new, more serious charge. The arrest came just a day after Ghosn took to Twitter to say he would hold a press conference on April 11. But his detention stymied plans to meet the press in person. A Tokyo court approved the extension of his detention through April 14. After that, prosecutors may ask for another 10-day extension, which would have to, again, get court approval. Planning for such a contingency, Ghosn's lawyers made the video message before the arrest. The latest arrest focuses on allegations Ghosn diverted company money for personal gain. Prosecutors allege that Ghosn then received a portion of those funds for his personal use through a bank account of a third company where his wife works. Prosecutors said $5 million of those transfers from Nissan was diverted to Ghosn's personal use, and they allege the same amount of financial damage was incurred to Nissan. Prosecutors have already slapped Ghosn with three indictments, two for allegedly misreporting tens of millions of dollars in deferred compensation and a third concerning alleged breach of trust. In the first two indictments, Ghosn is charged with falsifying company financial filings to hide some $80 million in deferred compensation. Ghosn has said that the amount was never fixed, nor were any funds disbursed. Thus, he argues, there was no need to report anything. Ghosn says the contract transfer caused no damage to Nissan and that the payments to the business associate were for legitimate services rendered to Nissan in the Middle East.